Final Fantasy XIV Online, massively multiplayer online role-playing game — an MMO barely alive. Square Enix rebuilt it. They had the technology. They had the capability to build the world's first relaunched FF title. A Realm Reborn is that game. Better than it was before. Better, stronger, faster. Unlike 1970's action heroes, video games don't often get second chances. They are developed, released, judged by fans and critics, and then live or die based on those judgments. By all rights, Final Fantasy XIV should have died. It was released in 2010 an unfinished, over-complicated mess. It was a gorgeous game bogged down by heavy-handed stabs at innovation, tripping over its own feet in an attempt to side-step genre conventions and set itself apart. I did not like it. Other critics did not like it. Most importantly, the players did not like it. It was not a good game. Square Enix agreed. After spending more than a year attempting to fix the existing game, the developer opted for a fresh start. Final Fantasy XIV closed down in late 2012. In August of this year, Final Fantasy XIV: A Realm Reborn sprang to life. The "sprang" bit is important. 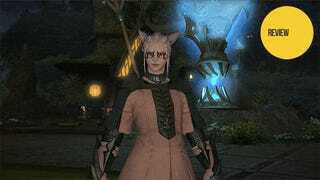 The first Final Fantasy XIV lurched to life, shambling forward uncertainly, bogged down by unwieldy game mechanics and obscured beneath a cloud of unnecessary complexity. The game wasn't quite sure what it was supposed to be, and that lack of direction was keenly felt by everyone involved in the early days of Eorzea. By shedding the unwelcome intricacy and exchanging a little innovation in favor of accessibility, A Realm Reborn is a much more confident endeavor. Realizing that rebelling against the status quo did its predecessor no favors, it revels in being exactly what the fans of the series wanted in the first place — a traditional fantasy MMO with all the Final Fantasy trimmings. Players are gaining experience points to earn new levels and learn new skills to slot onto their hot bar, but instead of a Wizard or a Fighter, they're a Summoner or a Dragoon. They're undertaking quests to rescue non-player characters from harm, but these NPCs have names like Biggs and Wedge. The fantasy lands they are traversing are gorgeously rendered Final Fantasy lands. The music they are battling to is beautifully orchestrated Final Fantasy music. There is no room for uncertainty in the Seventh Umbral Era of Eorzea, initiated following the tumultuous events that ended the original Final Fantasy XIV. Memories blurred by a five-year leap forward, adventurers are tasked with piecing together the events between the unleashing of the mighty Bahamut and the present day. After creating a character and selecting a starting class, players are engaged in a series of rapid-fire quests in their starting city, a succinct overview of everything they need to know about the game. Here's where you learn how to craft. Here's where you learn harvesting professions. Here's where you buy equipment. Here's where you get your class-based quests. Got it? Good. Now go have yourself an adventure. Thanks to a revamped quest system, having that adventure is just that easy. Players flow from quest giver to quest giver, smaller tasks giving way to larger story arcs, eventually coalescing into a story not unlike that of a traditional single-player Final Fantasy game. You know those Heroes of Light the series has been going on about since 1987? You might be one of those. Crystals are involved. 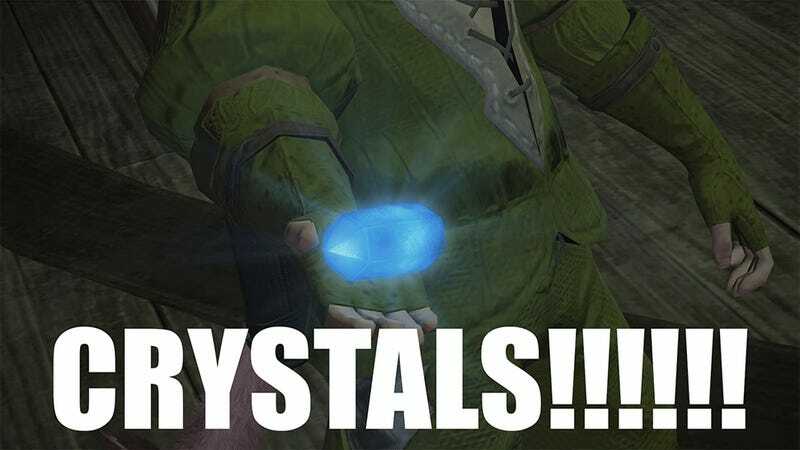 No one can resist the crystals. Sure, you're one of the thousands of Paladins, Black Mages, Summoners, Bards, or other traditional classes wandering the continent of Eorzea, but A Realm Reborn does an excellent job of making you feel special. You're a legendary hero, and the game never lets you forget it, even when you're teamed up with four other legendary heroes taking on a dungeon boss. Questing and dungeoneering are just two of the myriad means of keeping oneself occupied in Final Fantasy XIV: A Realm Reborn. The Guildleve system of repeatable quests that dominated the original game is still around, though not nearly as popular as it once was. It's been overshadowed by FATEs — Full Active Time Events — large-scale public quests geared towards delivering massive amounts of experience to grouped characters. Areas where FATEs spawn are filled with roving bands of players, silently moving from spawn to spawn. They're a convenient means of quickly leveling a character, if a bit impersonal. Characters in A Realm Reborn have the ability to learn every single class in the game, crafting, gathering and adventuring, and swapping between them is as simple as equipping the tools of the trade. With a spear in hand, my main character is a level 31 Dragoon. Swap the spear for a wand, and he's a level 8 White Mage with the important Protect buff, which I can share with my other adventuring classes. With skillet in hand he is a level 12 Culinarian, fully prepared to cook the living hell out of some trout, which he caught himself as a level 9 Fisher. There are eight starting adventuring classes leading to nine advanced jobs, eight crafting classes and three gathering classes. Many times I've found myself paralyzed with indecision upon logging into the game — which do I want to play? The problem is they all look and feel so good. Melee combat is quick and brutal with a focus on combos and positioning. Destructive spellcasting proffers a true sense of power. Even simple actions like taking a pick to a vein of ore or reeling in a fishing line have a certain flair, adding a degree of simple satisfaction to otherwise menial tasks. It's a wonderful sort of paralyzing indecision. I almost look forward to it, and should I ever reach the point where all of my classes are capped out at max level, I'll likely miss it. I'm quite a ways from the end-game as it stands, and I'm in no huge rush to get there — the ride suits me just fine. I didn't believe in Final Fantasy XIV: A Realm Reborn. The notion of a failed MMO getting remade into something worthwhile was so alien I couldn't fathom it. I looked at the pretty new screenshots. I watched the gameplay videos. I saw the changes behind made, but I couldn't accept them. This is the really real world — there ain't no coming back. Fahey, you're the only Kotaku writer who understands me. FFXIV 2.0 is EverQuest, DAoC in their prime. WoW from 2004 to 2007. You don't even understand how good it is until you play it. Looking back, it was an apt comparison. At the time, however, I replied with "I have played, and that's a fair comparison. It feels like a really nice version of a game I've already grown tired of." Final Fantasy XIV: A Realm Reborn is a combination of some of the finest fantasy MMOs, but it is more than that. It's a celebration of the finest fantasy MMOs with all the Final Fantasy trimmings, a tribute to those magical moments in the games AKA Alex mentioned, evoking the spirit of their brightest days. You don't even understand how good it is until you play it. This morning, as I was putting the finishing touches on this review, I got a reply back from "Alex." I've been reading your MMO logs, and I can't help but feel like you've changed your opinion since you sent this email to me.